I really love giving gifts. But, let me rephrase that, I really love giving heartfelt gifts. Giving a gift that's barely thought out or mindlessly chosen is not the kind of thing I'd want to impose on someone, nor would I ever want to receive it. Yes, sometimes, a hand crafted or handpicked gift is not as useful, as say, a gift card but I think it really is the thought that counts. I mean it's a popular phrase for good reason. That's why one of my most favoritist gifts to give are baked creations. They involve time, work and love - and bonus, they make people extremely happy! It just works out perfectly for me because I love to bake and I love to try out new recipes, but for sake of not overeating myself into oblivion, I can joyously offer my goods to my friends, family, and loved ones. 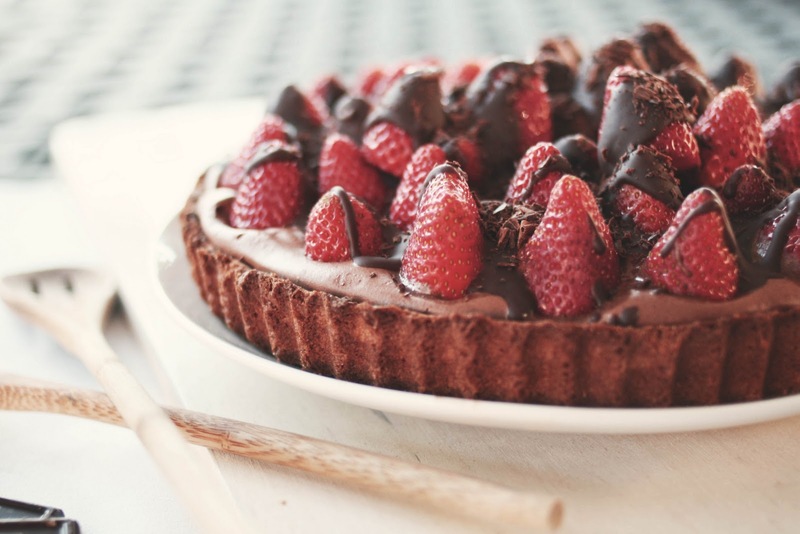 This strawberry tart is inspired by a tart I had from a lovely bakery, Zov's in Tustin. 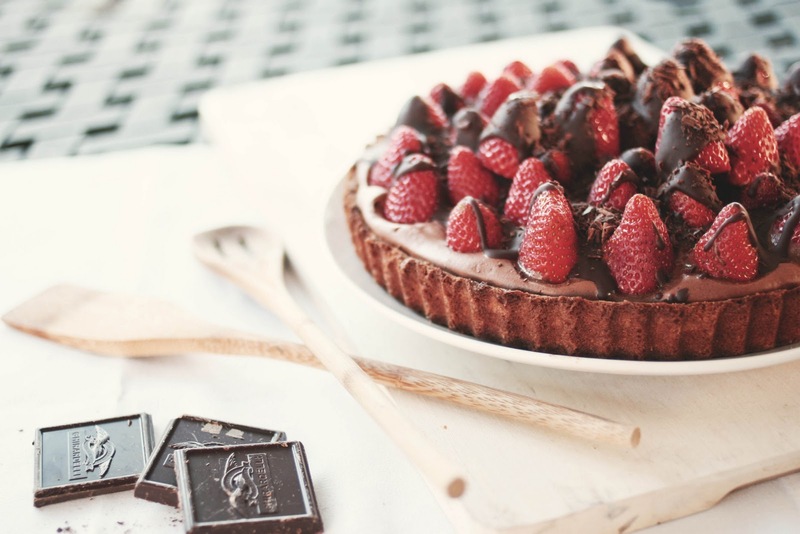 With a sugar cookie crust, chocolate mousse filling, fresh strawberry crown and chocolate ganache, this tart boasts of many decadent components. Yes, it sounds a bit frightful, but take each step one at a time, and you'll be a tart master in no time! I kind of over baked the tart shell slightly but it still turned out delicious. 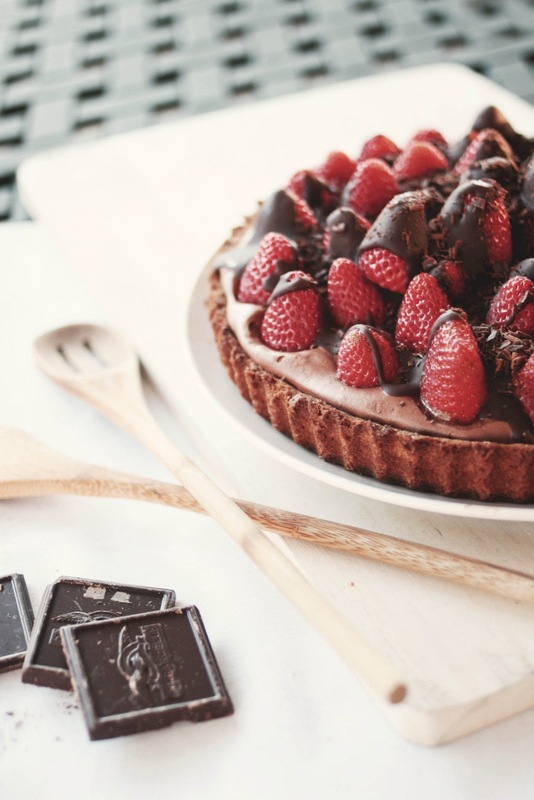 A chewy crust with impossibly smooth chocolate mousse. Ideally though, this tart would be best made in the summer, when strawberries are sweeter to contrast with the bittersweet chocolate mousse. To make the mousse, combine the chocolate and water in a heatproof bowl set over a pan of simmering water. Heat the chocolates until it is almost completely melted, siring occasionally. Remove the bowl from the heat and stir until the mixture is smooth. Set aside and let cool to near room temperature. In a clean, dry bowl of a stand mixer fitted with the whisk attachment, combine the egg whites and salt. Whip on medium speed until stiff peaks form - they should be thick and smooth. Stir the egg yolks into the cooled chocolate mixture. Add 1/3 of the whipped egg whites to chocolate and fold gently to lighten up the mixture. Fold in the remaining egg whites gently just until no visible streaks are left. Spread onto the cooled tart shell and refrigerate for at least 3 hours. Top with fresh strawberries. With your prepared sugar cookie dough, press the dough into a 9" or 10" tart pan (with releasable bottom). Make sure to go up the sides and that the dough is even all around the pan (about 1/2 cm thick). Bake according to package directions until golden brown all over. The dough will puff up, so while it is still hot, use the back of a large spoon to press down the center of the hot dough to make a well so that you can fill it with mousse later. Set aside to cool completely. To make the glaze, combine all of the ingredients in a small heatproof bowl set over a pan of simmering water. Stir frequently until the chocolate is almost completely melted, but do not overheat. Remove the glaze from the water bath and set aside to finish melting, stirring once or twice until perfectly smooth. To assemble, place your sugar cookie tart shell onto your serving plate. Pour about 1/4 cup of the glaze (just enough to cover the bottom) into the bottom of the tart shell and use a spoon to spread evenly across the bottom. Place in the refrigerator to set, about 10 minutes. 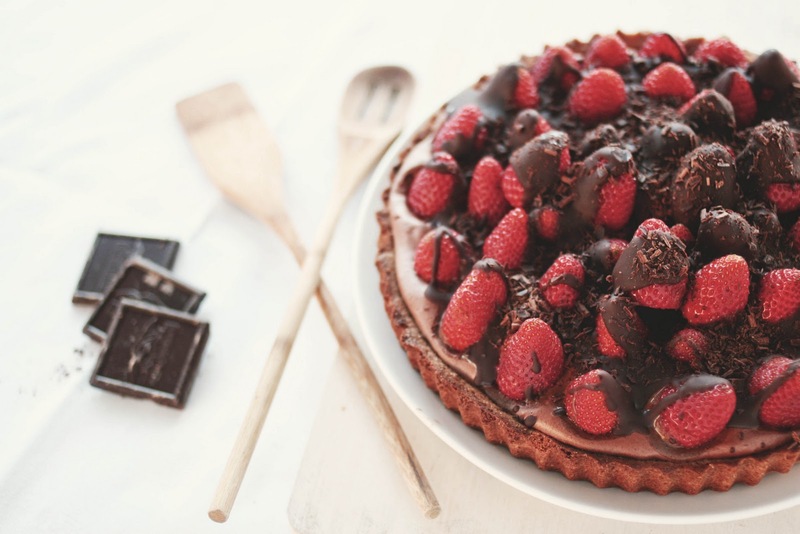 Once set, spread the chocolate mousse into the tart shell, and top with hulled strawberries (tips pointing upwards). Use the remaining glaze to pour on top of the strawberries, then sprinkle with chocolate shavings and allow to refrigerate for at least 2 hours to set. The strawberries are playing peek-a-boo! I would love to recieve such a beautiful gift like this! The strawberries make it actually very festive. Love the sound of that crust with the filling. My favorite kind of tart! Baked goods make the best gifts. ;) This looks quite beautiful. Whoever received this is a lucky person indeed. I also love to give my baked goods as gifts. It's lovely watching people's faces light up when they realize you it just for them :). This sounds absolutely amazing. Chocolate mousse - yummy! This is gorgeous. I'd be super happy to find this under my tree! MMMM. . . . chocolate mousse. This sounds divine. Oh, this is lovely! 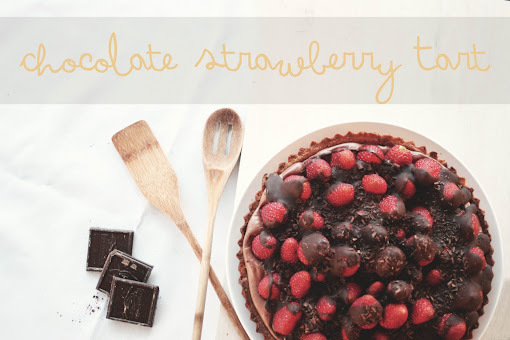 I'd like to make it, but I don't think you've mentioned how many strawberries to use. Did you use a pint? this really looks too good to be true! 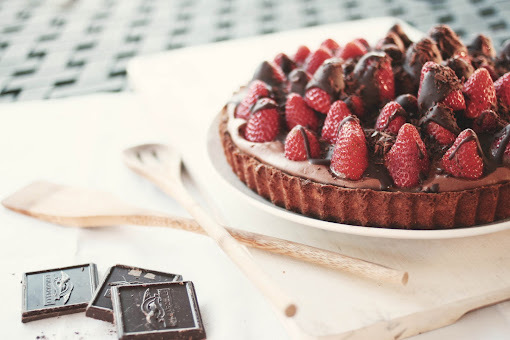 What an incredibly luscious and decadent tart tooo tempting!